To most people, chess represents a popular two-player strategic board game. But to Great Bend artist Jeremy Cale, chess represents art. He’s created a medieval chess set, inspired by an ancient European version. 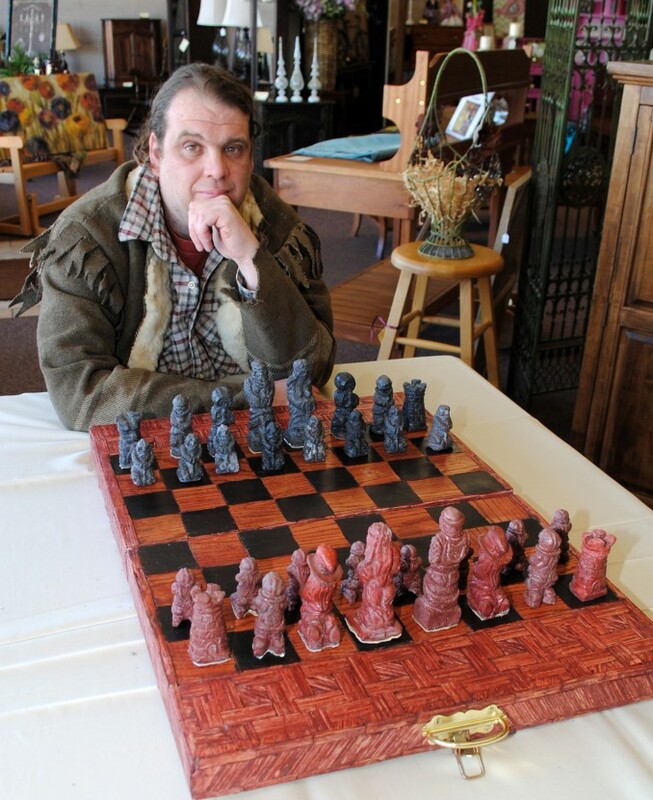 Art of Chess - Great Bend artist Jeremy Cale sits in front of his recently created chess set at Rosewood Furniture Gallery. Cale said it takes two days to properly cast each piece from Sculptcrete, then each piece is stained to the desired color. Another twist to Cale’s work is that he has created his chessmen from prototypes. He carved representative stone pieces and then created epoxy molds from those pieces. He has produced enough molded pieces to create three chess sets so far. Cale hand-crafted a chess board to go along with his first set and he is preparing to build more boards to go with the remaining pieces that he has created. His original board is made of pine with laminate. The board, which can fold in half, is painted and stained. Match sticks are layered and glued on portions of the board to give it a parquet effect. The inside of the board is lined with heavy-duty mull fabric to carry and protect the chess pieces. Cale’s challenges in completing his art are even more difficult than the typical starving artist faces. While paying for quality art supplies and materials is always a hurdle, Cale faces greater challenges as an artist. He lives with Asperger’s Syndrome, an autism-related developmental disorder, characterized by sustained impairment in social interaction and nonverbal communication. He says that his condition doesn’t have any bearing on his natural abilities as an artist, but he recognizes that he focuses on his art because of Asperger’s. Quite simply, his world revolves completely around creating art, making it impossible for him to function in a regular environment. For the past 16 years, Rosewood Services has been with Cale, helping him to balance his life with his focus and passion for art, so that he can live independently. It’s an arrangement that Cale said saved his life when he was living hand-to-mouth as a young man in Dodge City, prior to moving back to his hometown of Great Bend. 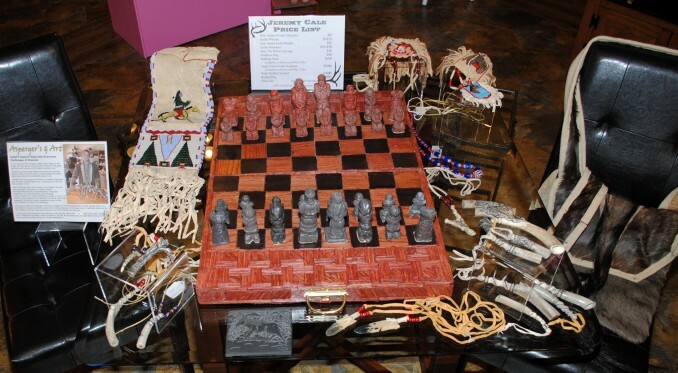 Those interested in seeing Cale’s chess art can view his display at Rosewood Bargain Barn through mid-April. Cale said he will reproduce a limited number of chess sets, if people are interested in purchasing them. Though Rosewood will help to facilitate the arrangement, all purchases of Cale’s work will go to the artist. Asperger’s and Antlers, Artist’s Passion Helps Him Overcome Challenges of Disorder - Read more about Great Bend nature artist Jeremy Cale. Jeremy Cale's chess board and other artwork are featured at Rosewood Bargain Barn through April 15, 2017.